“A glorious cat clawing rampage,” is how The New York Times critic reviewed George Cukor’s The Women when it was released in 1939. Several actresses in the landmark film amped up the glam in their wardrobes for the battles royale with arsenals of their own jewelry that fit right in to their roles. Set in the rarefied world of Park Avenue society, the film’s action swirls around the gossip and facts of affairs, marriages and divorces. The rapid fire dialogue is so engaging you may not even notice till at least the half-way point, there are no men in the movie. Not one male actor appears in the entire production. What may sound like a gimmick was actually a genius way of showing the feminine angle of the story exclusively. The concept works by placing the action in locations where it is completely plausible there would be no men around: a spa, private homes, a fashion show, the fragrance counter of a department store and an elaborate ladies room at a club. 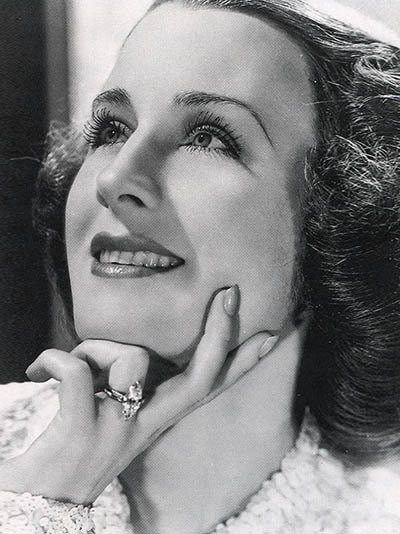 Norma Shearer in her marquise-cut diamond engagement ring. The call sheet for the production included almost every major actress on MGM’s roster. There was Norma Shearer, Joan Crawford, Rosalind Russell, Paulette Goddard and Joan Fontaine among many others. 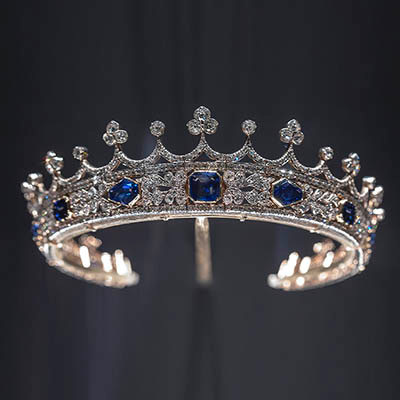 The exact details on all the jewelry worn in the movie is not known but zeroing in on the collections of Joan Crawford, Norma Shearer and Paulette Goddard reveals these stars felt their treasures were key to their characters not to mention helping them shine in the sea of women who could be as competitive off-screen as on. “How am I supposed to get ahead when Norma’s sleeping with the boss?” was a line delivered in real life by Crawford after Shearer married MGM’s head of production, Irving Thalberg in 1927. It could easily have been a part of Clare Boothe Luce’s script for the film. In several scenes of The Women, Shearer wore her large marquise-cut diamond engagement ring from Thalberg It was a poignant jewelry statement since her husband, “The Boy Wonder” of MGM, had passed away three years before the movie was made. Shearer might have also been inspired by the fact that other women seemed to be wearing their own engagement rings in the production. 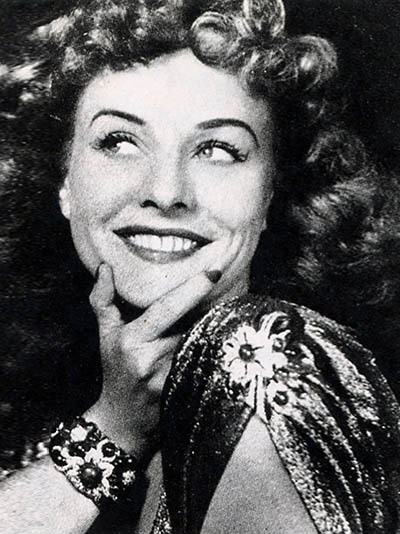 Paulette Goddard posing in her Trabert & Hoeffer-Mauboussin jewels in 1940. In what can only be called a costume continuity goof, a big cocktail ring is also worn by Shearer on the third finger of her left hand. Reportedly the piece was “borrowed” and worth $175,000. Both facts seem highly unlikely. Just count up all the big cocktail rings in the movie, Shearer’s may have been bigger but the value is totally off the mark. 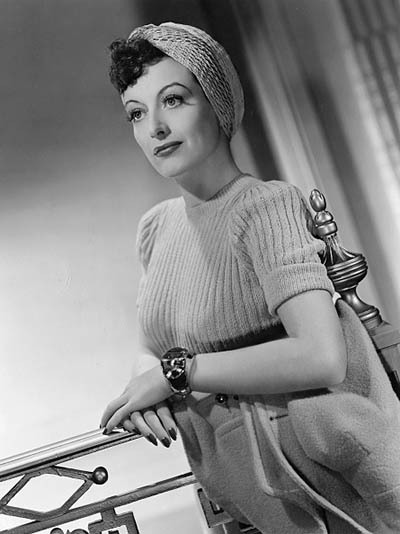 The leading lady also sports several wide and line diamond bracelets in the film, some daytime brooches and the usual treasure found in a star’s jewelry box of the era. Paulette Goddard’s goodies in the movie were gifts she received from her husband Charlie Chaplin. One demi-suite was a consolation prize Chaplin gave Goddard after she lost the most sought after role in Hollywood of Scarlett O’Hara in Gone With the Wind (1939) to Vivien Leigh. The cuff bracelet and matching large earrings the actress wears as clips in the movie, came from one of the most popular jewelers in Hollywood, Trabert & Hoeffer-Mauboussin. 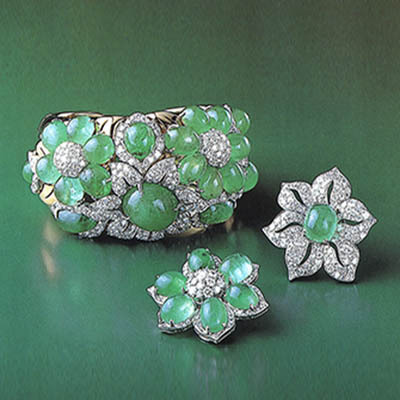 Diamonds and emerald cabochons that looked like jelly beans were set in the petals and centers of the 18K gold cuff. Goddard’s other splashy designs spotted in the film included a large cocktail ring that certainly could have been her aquamarine and diamond piece by Paul Flato. When she powders her nose a couple of times, she does so using her oversized gold compact that is about the size of a discus and covered in gem and enamel charms with personal meaning such as the letters from her nickname, Peter, three pet Scotties, two drummer boys that were a gift from composer George Gershwin and her husband Charlie Chaplin dressed as The Little Tramp. When she uses the compact as a prop and is formally dressed the piece makes perfect sense but with a wink and smile she also uses the lavish compact when she is on a ranch in Rio. Joan Crawford only has a couple scenes in The Women when she has risen from shop girl to Park Avenue housewife and she makes the most of them. 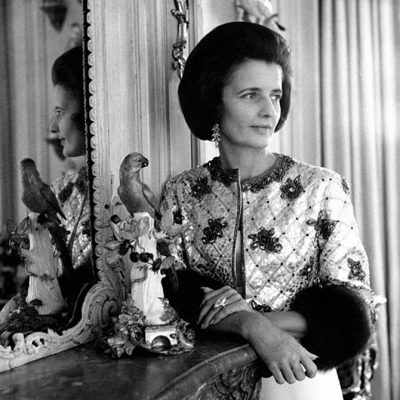 As the actress was a well known jewelry collector it is safe to say all the jewelry was real and it was her own. 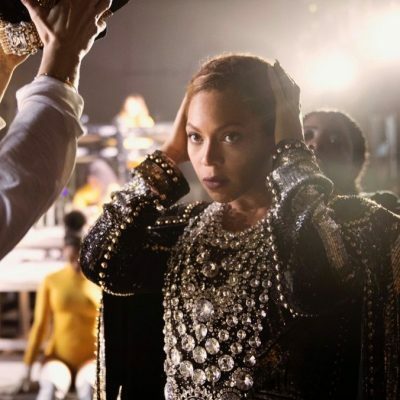 Another clue that the pieces belong to her is she wears the same jewels in two scenes with what appears to be a gold lamé ensemble and a sequined number. 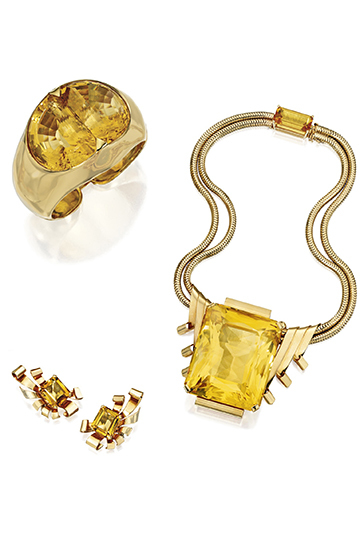 Clearly the cuff is her Raymond C. Yard jewel set with two gigantic half-moon shaped citrines set in a circle. 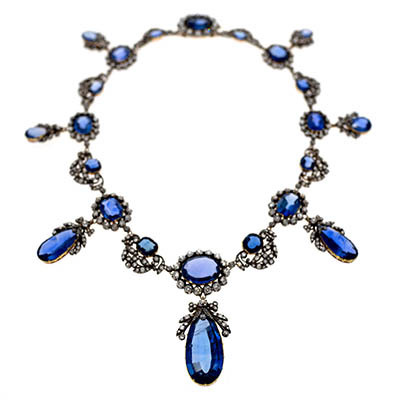 It was part of a suite including a necklace with a 350-carat citrine and clips that sold on December 5, 2012 at Sotheby’s in New York for $56,250. In this clip, “The Confrontation Scene” the cuff and a ring can be seen clearly on Crawford. The large ring Crawford flaunts in the film seems like it might have been a large cocktail ring she received from her second husband actor Franchot Tone when they got divorced. Yup, they consciously uncoupled with a piece of jewelry in 1939. The classy actor gave her 104.52-carat amethyst ring from Raymond C. Yard. In this clip, “The Confrontation Scene” the cuff and a ring can be seen clearly on Crawford. 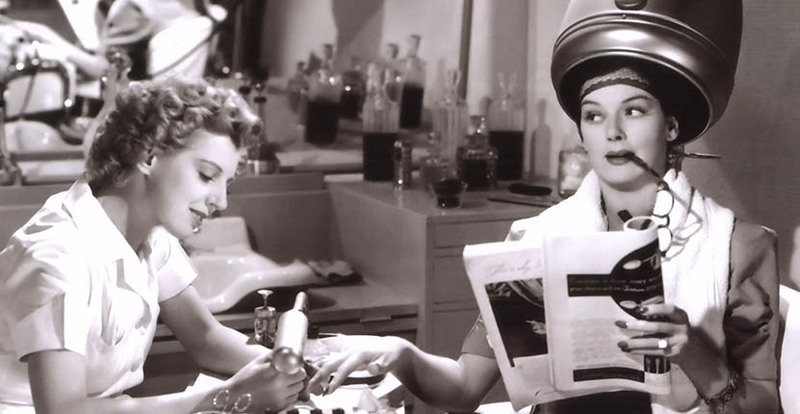 With all the goodies the actresses pulled out of their own collections its fair to review the film as jewelry showdown as much as a “cat clawing rampage.” It is must see for anyone who loves classic Hollywood films and jewelry. For more Hollywood classics, get intriguing jewelry details on the Katharine Hepburn 1940 screwball comedy here.